Why the travel booking specialist's beaten-down stock might not be a good bargain today. This was supposed to be the year that TripAdvisor (NASDAQ:TRIP) started traveling in the right direction again. After announcing lower sales in 2016, management said that operating trends had turned a corner in the fourth quarter -- and so they predicted a return to double-digit growth in the hotel business in 2017. The online travel booking specialist lowered that outlook for the second straight time in early November following disappointing third-quarter results. CEO Steve Kaufer and his team now believe the hotel segment will be flat for the year as trends worsen in the fourth quarter while likely staying weak in 2018. That downbeat forecast suggests TripAdvisor stock might not be a great deal even though it is down over 20% so far this year, compared to an 18% spike in the broader market. TripAdvisor's hotel segment contracted in the third quarter as its core revenue per hotel shopper metric fell 11% to mark a sharp deceleration from the 2% drop in the second quarter. The magnitude of that slowdown was a surprise considering that the company had just rolled out major improvements to its travel booking process. TripAdvisor also spent almost $60 million during the quarter on its first television advertising campaign. TRIP Revenue (Quarterly YoY Growth) data by YCharts. The company didn't blame a shift to mobile devices for the slowdown, as it did three months ago when it missed management's second-quarter targets. Instead, TripAdvisor said click-based pricing fell as its advertising customers issued lower bids for its ad space. "We do not control what our partners are willing to pay for leads," Kaufer said in a conference call while implying that the dip was temporary. "Our ongoing initiatives are aimed at driving higher click-to-book conversion for partners," he continued, "positioning us for greater revenue per hotel shopper over time." There were bright spots in the third-quarter report, too, including a big jump in both the size and profitability of TripAdvisor's non-hotel business. This segment is anchored by an attractions-booking niche that could become massive over time. The company bulked up its base of bookable attraction products by 30%, and demand for these entertainment and dining experiences helping adjusted earnings margin jump to 35% of sales in the segment from 15% a year ago. In fact, the improvement in this division explains why TripAdvisor hasn't lowered its 2017 earnings outlook despite worsening results out of its core hotel business. Engagement metrics are solid, too, with traffic rising 17% to 455 million. That total keeps TripAdvisor firmly in a leading spot in the industry, where it enjoys one of the largest, most engaged global travel communities online. Kaufer and his executive team warned investors to brace for more weakness in the hotel business through at least the first half of 2018. The good news is management thinks this downturn just reflects volatility around temporary challenges such as ad pricing and the rate at which vacation shoppers are migrating toward mobile devices. They also point to promising engagement trends and booming demand in the non-hotel segment. However, this was the second consecutive quarter that TripAdvisor found it necessary to dial back its operating forecast for the hotel division. Investors willing to expose themselves to additional downgrades might be tempted by the 25% decline the stock has endured this year. I wouldn't jump at that prospect, though -- at least not until management shows they have a handle on the shifting industry trends. 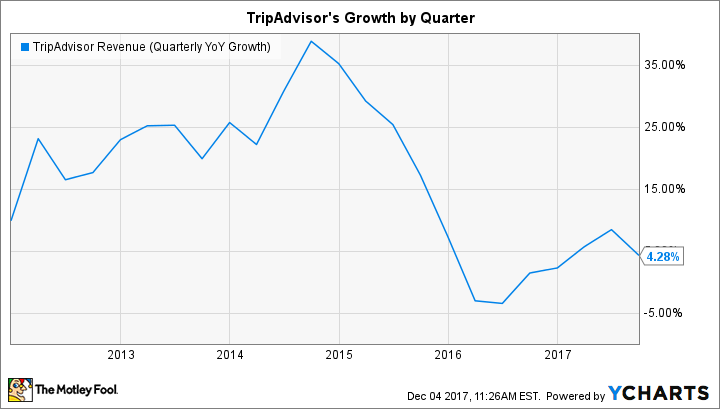 It seems possible that 2018 will mark the third straight year of falling profits in TripAdvisor's core hotel segment, which would be bad news for a growth stock that's still valued at over 70 times earnings.